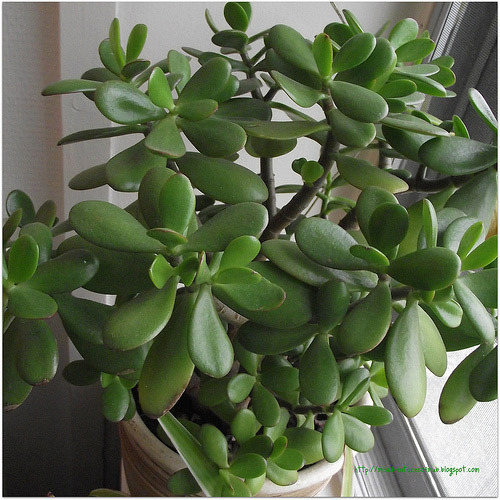 JADE - (CRASSULA ARBORESSCENS/OVATA) - Also known as "Money Tree". Technically not a tree but a succulent of which there are many varieties but arborescens is the most common for BONSAI>BONSAI. The "spongey" trunk bears thick, round, grey-green LEAVES which are borne in pairs at right angles to the previous pair. WARNING : Water can be the worst enemy of the jade plant. They put out ROOTS in dry soil to find water, whereas other SPECIES only root where water is present. Never keep roots constantly wet. 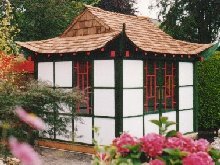 JADE PAVILLIONS - Jade Pavilions designs, builds and installs a range of unique, contemporary teahouses, pavilions, bridges and entrances with a nationwide installation service and international delivery. Please note that this will be changed regularly to avoid unnecessary SPAM. Please use the reply address for your Address Book. (Send Image) JAPAN JOURNEYS - Agent for tours of Japan - includes specialist BONSAI>BONSAI tour, amongst others. (Send Image) JAPANESE LARCH - The Japanese larch (LARIX KAEMPFERI) is a slender, upright trees with bright green, NEEDLE-like LEAVES, which turn golden in autumn before shedding in winter. The Japanese larch is distinguishable by its red/orange new twigs which darken to almost purple in winter. (Send Image) JAPANESE MAPLE - See ACER PALMATUM. (Send Image) JAPANESE TERMS (LIST) - Most of the mainstream terms relating to tree type, style or tree parts can be found defined individually in the appropriate section of this AtoZ. 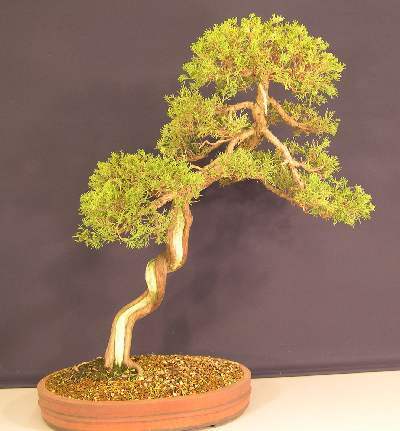 The attached website provides a comprehensive list of Japanese terms related to BONSAI>BONSAI which also includes some of the less common terms. (Send Image) JASMINE - WINTER (JASMINUM NUDIFLORUM) - Bears rich, yellow FLOWERS on leafless stems during winter, followed by profuse, narrow, green LEAVES in spring and summer. STYLE : Suitable for informal upright, slanting, semi-cascade, root-over-rock and CLUMP styles. WARNING : Shelter from winter winds. Avoid waterlogging, especially if frost expected. (Send Image) JASMINE ORANGE (MURRAYA PANICULATA) - Jasmine is a TROPICAL, EVERGREEN shrub with mid-green, oval LEAVES in PINNATE form and white, aromatic, bell-SHAPEd FLOWERS, which develop into orange berries. Also known as Satinwood tree because of its pale, smooth BARK. STYLE : Suited to informal upright, slanting, semi-cacscade, twin trunk, CLUMP and group styles. WARNING : needs minimum temperature of 17 degrees centigrade, so should only be grown indoors in temperate climate - but needs shading from hot summer sun. 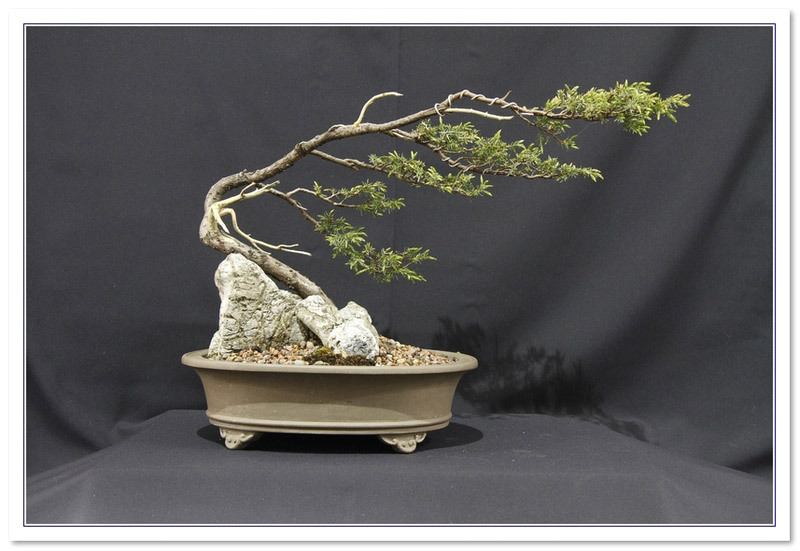 JIN - In BONSAI>BONSAI, jin is the Japanese term that refers to a dead branch which has lost its BARK. It may also be used as a verb i.e. to jin (a branch). In the wild, dead branches are eventually bleached white or pale grey by the elements. This occurs commonly in confers, especially JUNIPERS and pines, but less so in DECIDUOUS TREEs (oak would be an exception). The process is replicated in bonsai by shortening branches to stubs, stripping the bark and splintering the HEARTWOOD to a naturalistic form. The jin may then be arificially bleached in order to reproduce the colour seen in nature. Jin means "God" and is symbolic of the Supreme Being's influence on nature. 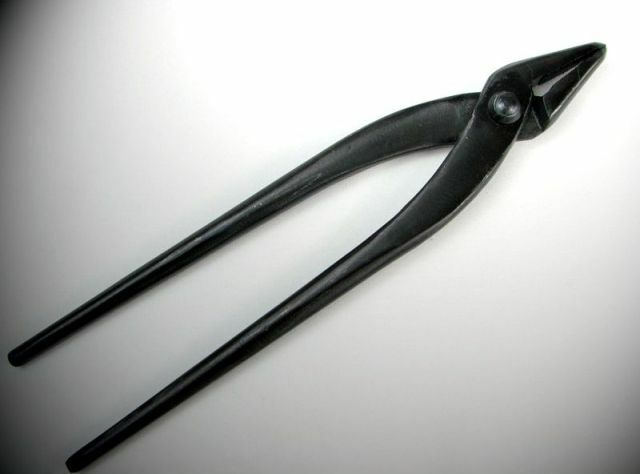 JINPLIERS>JIN PLIERS - These specialist pliers are normally used for the forming of jin. They (often but not always) have a "bent nose" which facilitates the gripping and tearing of BARK and wood when stripping a stub down to HEARTWOOD. They are also useful for holding and bending the thicker gauges of wire. (Send Image) BONSAI>BONSAI>JOHN MILTON BONSAI - Blog of a young Englishman working as a bonsai student in Japan. BONSAI>BONSAICERAMICS>JOHN PITT BONSAI CERAMICS - Based in Derbyshire, UK - maker of high quality hand-made Bonsai and ACCENT POTs for the discerning enthusiast. Very interesting section on website on pot selection criteria. Pots can be reserved or commissions ordered. Not all pots for sale are in the online shop. Need to contact to check stock. UK delivery is free. JU-SHIN - Top of the tree. It is also called ''ATAMA'' (head of the tree) and ''shin'' (APEX of a tree). In preparing for a BONSAI>BONSAI tree's SHAPE, the appearance of its top in a satisfactory form affects the status of the tree. - Presentation and health of tree and any UNDERPLANTING or moss. JUNIPER - CHINESE (JUNIPERUS SINENSIS) - EVERGREEN tree originating from mountains of Japan is distinguished by rich, green, cloud-like foliage emanating from flaky, grey/brown BARK covered trunks which, in older specimens, can be gnarled and TWISTED with areas of naturally occuring, exposed "driftwood". 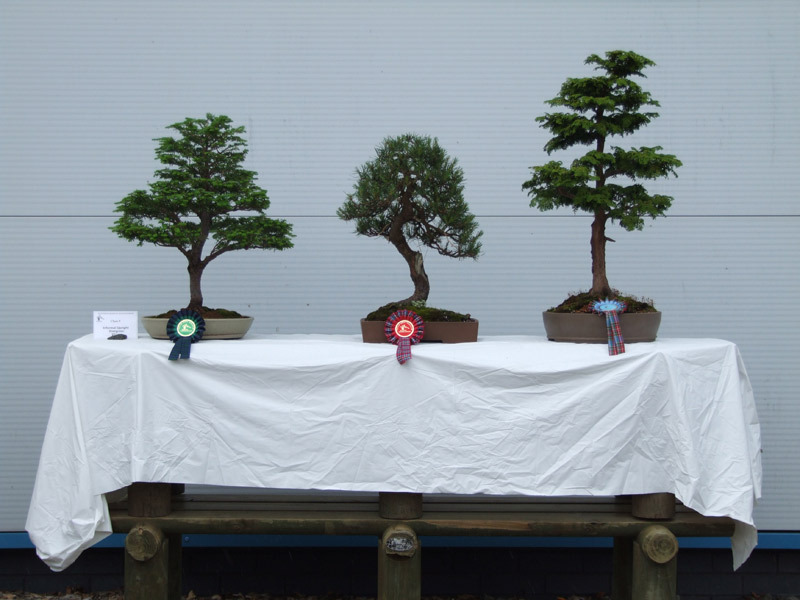 Most common VARIETY used in BONSAI>BONSAI is Sargentii but Aurea, Japonica, Kaizuka and Pyramidalis are also used.